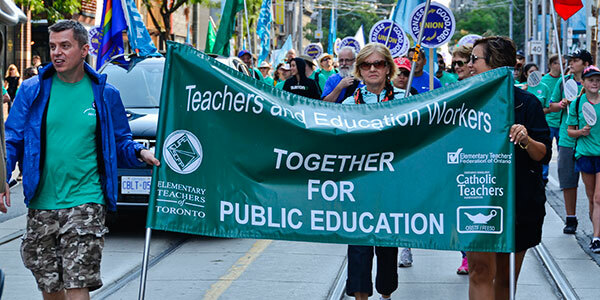 On Monday, September 4, 2017, ETT members joined with colleagues from ETFO, OSSTF, OECTA, CUPE, and thousands of friends from other labour locals to march in solidarity in the 2017 Toronto Labour Day Parade. Teachers and education workers took this year’s parade theme, to “Step Up and Speak Out,” to heart, by attending in large numbers to champion workers’ rights and to call for improvements to our shared public education system. Photo courtesy of the Toronto & York Region Labour Council (@TorontoLabour).